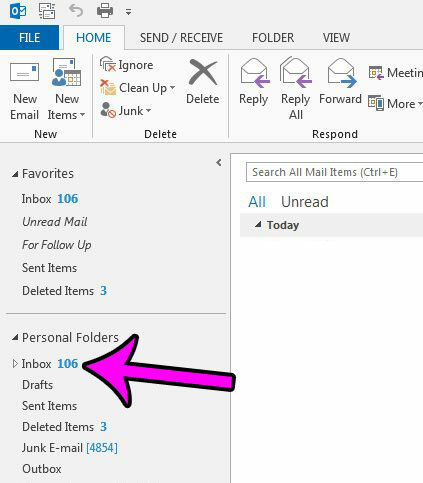 Setting up a new email account in Microsoft Outlook, especially if it’s an email account that you have been using for a while, often comes with the surprise of a high number of unread email messages. At first you might go through and manually click each message to mark it as unread, but that can be tedious and impractical. Fortunately Excel 2013 has a quick way for you to mark all of your unread email messages as read. Our guide below will show you the short series of steps required to do this. These steps are going to mark all of the unread messages in your inbox as read. Any new messages that come in after this will be marked as unread until you read them. 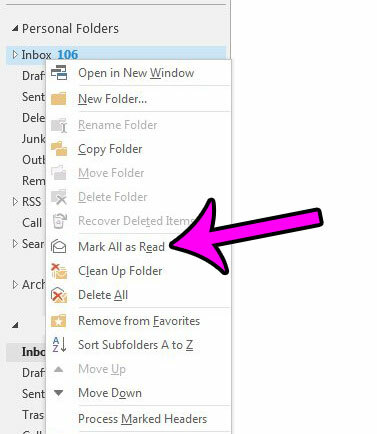 If the email account that you have setup in Outlook 2013 is an IMAP account, then these steps will cause your messages to be marked as read in other locations where you check your mail as well. Step 2: Locate your Inbox in the folder list at the left side of the window. Step 3: Right-click on the Inbox, then click the Mark All as Read option. Note that this might take a while if you have a lot of email messages in this folder. Do you receive a lot of emails, and the constant “dinging” sound is bothering you? Learn how to adjust the notification sound setting in Outlook 2013 and get that sound to stop playing.